In some cases you need to configure URL redirection so your web page can present different pages according to a source URL without having to do this configuration inside webpage. You will need to have access to a working #WebhostingManagement installation where to configure URL redirections. 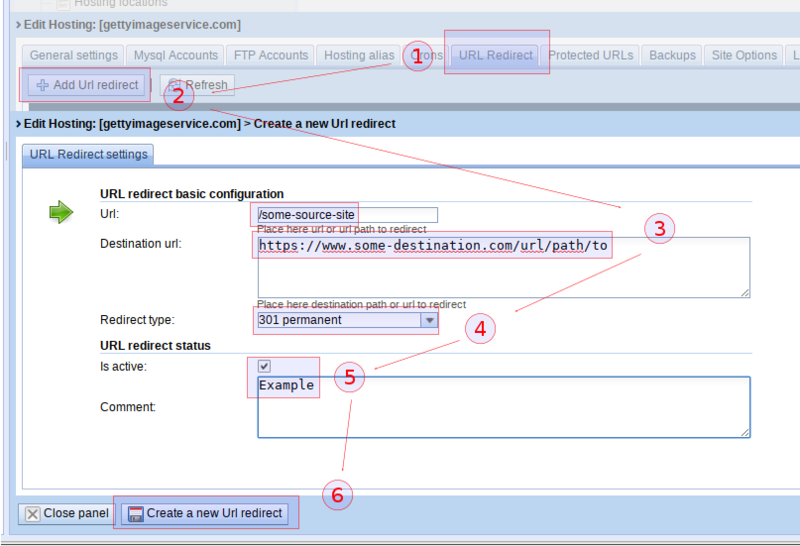 All URL redirection configured is placed directly into Web server configuration, without touching your site .htaccess file (for example). This makes possible to configure URL redirection not only for webpages with php but also for the rest of technologies available. At the same time, this avoids any possibility to interfere with software doing .htaccess automatic changes like #Wordpress or #Prestashop. It is known working cases where users are configuring more than 40.000 url redirections without any issue. It is not known where could be performance problems though 40.000 is a good number. If you already have checked your system have enough memory available, then possible there’s a ulimit configuration problem. All releases may suffer this problem. 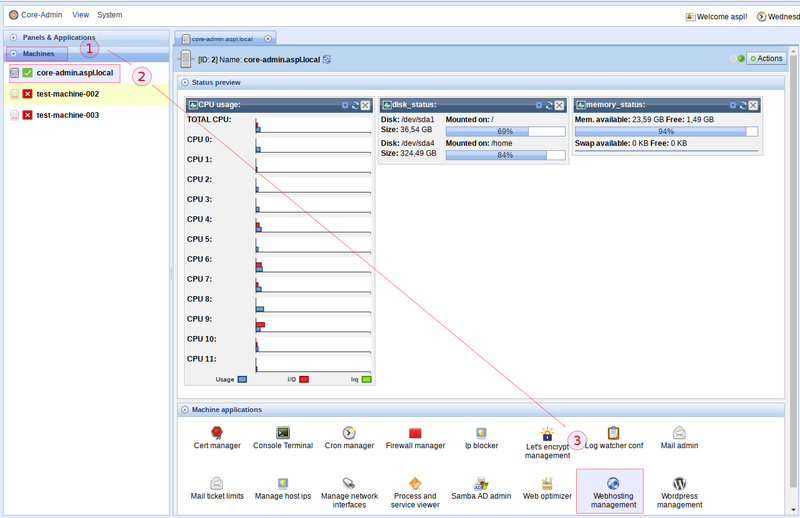 It’s not a bug but a system resource configuration problem. The problem is caused by a system ulimit configuration that is limiting the amount of memory that can be used by the core-admin agent or the core-admin server (turbulence). After that, try to restart the agent to see if the problem is solved. Upgrade your core-admin packages. Since release rev5010, it is already included a fix to automatically correct this setting when starting the software. 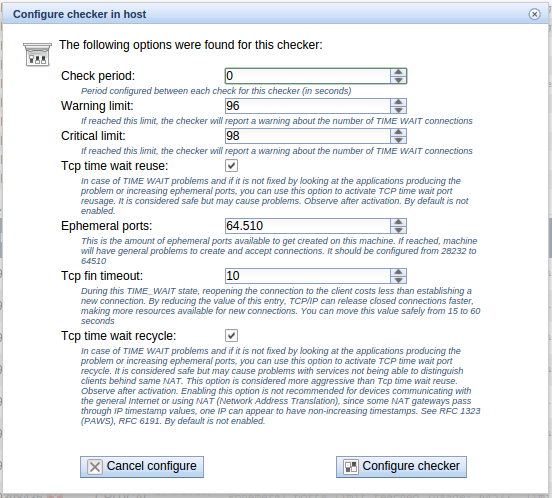 The KB http://www.core-admin.com/portal/kb-24032014-001-dealing-with-time-wait-exhaustion-no-more-tcp-connections about managing time wait configuration problems reported by time wait checker has been updated to allow configuring TCP TIME WAIT recycle option (/proc/sys/net/ipv4/tcp_tw_recycle). The article also includes additional infomation about how this option relates (and may cause problems) with devices behind NATing firewalls when the server running this option is accessed from there. The article also includes a reference to Troy Davis’ article http://troy.yort.com/improve-linux-tcp-tw-recycle-man-page-entry/ which explains in more detail how this happens. All releases may suffer this problem. It’s not a bug but a resource exhaustion problem. The problem is triggered because some service is creating connections faster than they are collected for reuse. After TCP connection is closed, a period is started to receive lost packages for that closed connection, to avoid mixing them for newly created connections with the same location. If that range is exhausted, no more TCP connections can be created because there is no more ephemeral (local port) available. Identify the application that is creating those connections to review if there is a problem. If it is not possible, increase ephemeral port range. See next section. If increasing ephemeral port range does not solve the problem, try reduce the amount of time a connection can be in TIME WAIT. See next section. If that does not solve the problem, try activating TCP time wait reuse option which will cause the system to reuse ports that are in TIME WAIT. See next section. In the case you cannot fix the application producing these amount of TIME_WAIT connections, use the following options provided by the time_wait_checker to configure the system to better react to this situation. Now use options available as described and using them in the recommended order. In general, both options shouldn’t be used if not needed. The following solutions are not quick and requires preparation. But you can consider them to avoid the problem in the long term. SOLUTION 1: If possible, update your application to reuse connections created. For example, if those connections are because internal database connections, instaed of creating, querying and closing, try to reuse the connection as much as possible. That will reduce a lot the number of pending TIME_WAIT connection in many cases. SOLUTION 2: Another possible solution is to use several IPs for the same service and load-balance it through DNS (for example). That way you expand possible TCP location combination that are available and thus, you expand the amount of ephemeral ports available. Every IP available and serving the service double your range. In any case, SOLUTION 1 by far best than SOLUTION 2. It is better to have a service consuming fewer resources. vmap allocation for size 9146368 failed: use vmalloc= to increase size. This means the kernel internal memory has reached valloc limit. All Core-Admin releases that uses a Linux kernel superior or equal to 2.6.32. In this example, VmallocTotal is telling us we have around 128M of allowed valloc memory. With this value, we have to increase it to something bigger like 256M or a 384M (which may be too much). To update this value we have to pass a parameter to the kernel at boot time.